Art print editions of my work will be shown alongside prints and originals of the Threyda art collective. 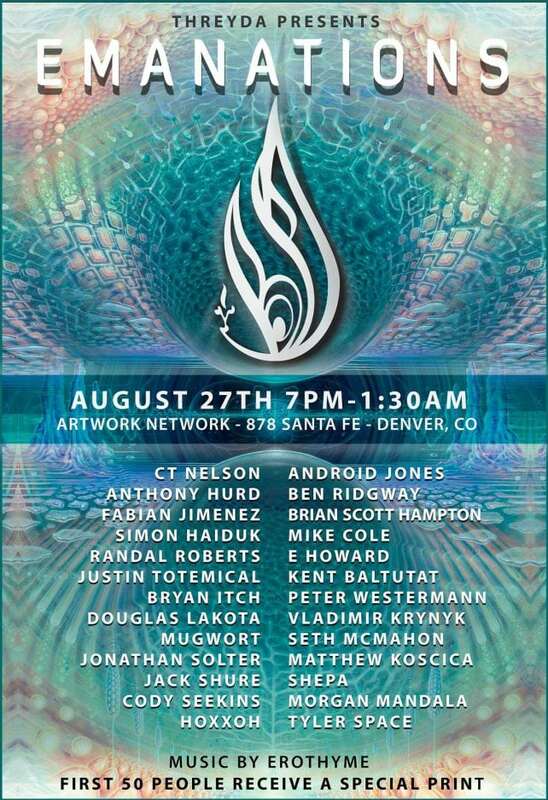 Artists include: Android Jones, CT Nelson, Anthony Hurd, Ben Ridgeway, Fabian Jimenez, Brian Scott Hampton, Simon Haiduk, Mike Cole, Randal Roberts, E Howard, Justin Totemical, Kent Baltutat, Bryan Itch, Peter Westermann, Douglas Lakota, Vladimir Krynyk, Mugwort, Seth McMahon, Jonathan Solter, Matthew Koscica, Jack Shure, Shepa, Morgan Mandala, Hoxxoh, and Tyler Space. Music at the show will be performed by Erothyme. If you’re one of the first 50 in the door you get a special print!